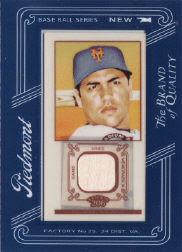 I happen to own one T-206 card. It’s not worth a lot but I think it’s very cool. If you don’t have one getting a box of this recent Topps release should satisy the urge without breaking the bank. A box costs under $100.00. The 2009 version features full size cards but the photography looks aged and the backs of the cards have tobacco-esque stains just like the originals! There is no shortage of rookie cards so collectors will want to focus on the cards that simply say “Rookie” and the league on the back, nothing more, or they will want to look for the brown bordered cards. The other short printed rookies are minis.